Good morning, #Lagos! The countdown begins! Less than a month before we will see your beautiful faces in Lagos for the historic Social Media Week conference! Get excited! We’re drumming up all sorts of great events for you all and we’re excited to meet all of our broddas and sistas — for some of us, it will be a trip home and for others, an amazing experience in a new country. 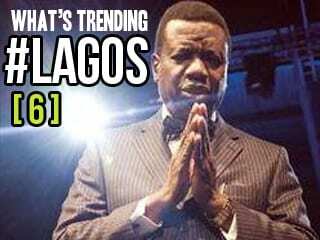 In the mean time, here is the sixth installment of #WhatsTrendingLagos or #WTLagos, where I provide a small sampling of trending topics, events, etc that we’ve been talking about! Nigerian House of Representatives moves to ban energy drinks: Get your liquid energy while you can, Nigeria. Tuesday, the House of Representatives moved to ban the importation and sale of energy drinks in the country. It doesn’t seem to be an official ban yet, but it might be headed that way. We all know energy drinks aren’t good for us, and the trend of mixing energy drink with alcoholic beverages is a major contributor to reported health risks and even deaths. What do you think? Chelsea footballer kicks ball boy: This has nothing to do with Lagos, really. But football (soccer – come now!! you knew that!) always generates big buzz on social media. Eden Hazard (ironic name in this instance) plays for English team Chelsea ,and the Internet is exploding because he kicked a young ball boy — not the actual soccer ball, but the ball BOY…on purpose…during a game…that was broadcast on television…for…being too slow. I don’t link to violent content of any kind, so if you haven’t heard of it already, just peruse on your own 🙂 The boy is not pressing charges, btw. 1M People like Pastor Adeboye (and God) on Facebook: The first Nigerian Facebook brand page to reach 1 million “likes” or “thumbs up” belongs to the renowned Pastor Adeboye. As of right now, 1,006,219 people have liked the page making it the most popular Nigerian fan page on Facebook! Just a little bit of social media news for you. Interesting that the most popular isn’t a musician or footballer. Many conversations we could have about how that reflects the Nigerian society as a whole. Bookmark it and we’ll talk in Lagos soon! What did we miss? Got a product, event, song, film, etc that’s got Lagos buzzing? Be sure to follow us on Twitter: @SMWLagos and visit us on Facebook: Social Media Week Lagos and let us know what’s trending in Lagos. Use the hashtag #WTLagos so we can spot you, and you could see your suggestion on next week’s #WTLagos!